If someone said they were traveling to the desert to rest, relax and recharge, you might think they had lost their mind. But take one look at Palm Springs in California and you will likely never have a negative thing to say about the desert again. Whoever thought to put a resort city here sure did make a fantastic decision. 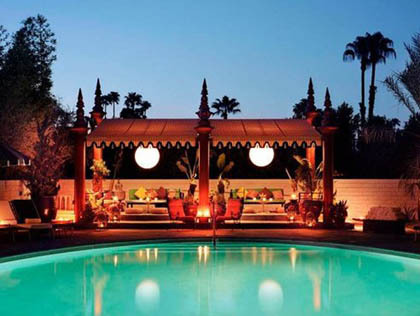 Head to the fabulous Palm Springs and realize the true meaning of desert chic. Located just 37 miles east of San Bernardino and 111 miles from LA, Palm Springs is situated in such a place that traveling to get here is never difficult. If driving here requires too much travel time never fear, the Palm Springs International Airport will welcome you in style. During your stay, check out the impressive shopping at the numerous retail shops and boutiques. When you get hungry, dining in Palm Springs will seem like a vacation in itself. The trendy resorts offer exquisite restaurants while the stand alone establishments impress with posh interiors and top notch menus. At sundown get ready to dance with some vibrant nightlife. Of course you can find a number of other activities like tennis, golf or polo and let's not forget the hiking, museums and spas. There is no doubt that your itinerary will be full during your stay in Palm Springs, just make sure you take the time to relax by the pool too. At WhatAHotel! we pride ourselves on our selection of impressive and elegant hotels and resorts. When heading to Palm Springs we have a hotel that will do it's best to rival the sophistication of the city that surrounds it. Enter the resort grounds of Le Parker Meridien Palm Springs and let your vacation begin. The grounds are lush and welcome you to the refinement of The Parker. The decor and design of the entire hotel is flawless yet also comfortable. Stay in one of the lovely suites or splurge for a night or two in the estate. Either way you will find all of the amenities and conveniences you will need to make your stay absolutely perfect. Although the restaurants in Palm Springs are delectable, Le Parker showcases three locations on-site where you can enjoy a quick bite, a romantic dinner or a after dinner drink. The spa and fitness center will help to ease your stress or you can head outside to try your hand at a game of crochet or take a dip in the pool. Life at The Parker will prove to be anything but stressful. By booking your stay with WhatAHotel! we can ensure you will receive exclusive and complimentary perks and benefits that will surely make your trip memorable. Palm Springs is a true desert oasis. Make the decision that celebrities and the Jet-set have been making for years, plan your trip to Palm Springs, CA. Beauty, grace and elegance will greet you upon arrival, so get ready for a dream vacation.